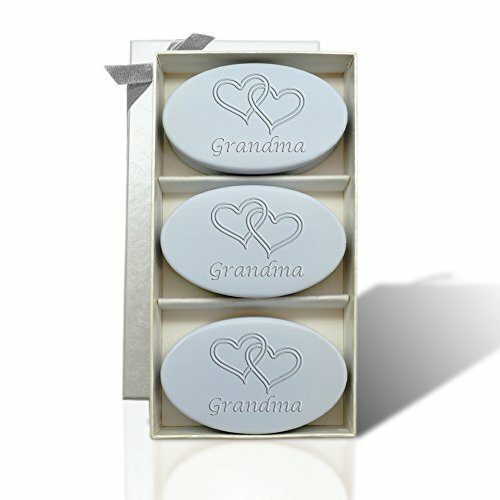 Celebrate your beloved Grandma, the perfect gift for her on Mother's Day and every day! Wild Blue Lupin: Romantic Blue in color is known to improve concentration and clarity. A gentle floral scent. Each Vermont made bar is a generous 5 ounces, vegetable based and triple-milled for long lasting lather. Our bars are individually addressed & intricately carved. Our carving style, beyond engraving, is uniquely definitive with each bar elegantly presented. Trios are also a wonderful opportunity for wedding favors, shower gifts, corporate promotions and event decor. Do you have a special request? Just ask! Soap Description: Made in Vermont! 100% Vegetable Based, Triple-Milled for Luxurious Lather, Freshest Personalized Soap in the Marketplace. Aqua Mineral is a gentle yet intoxicating scent. Box Description: Exterior is a beautiful pearlescent white with a timeless brocade texture and a white velvet-like interior. All of the board is 100% recycled chip board material. The paper wrap (what gives the box color, about 15% of the total product) is made from 100% recyclable virgin materials. For your safety our boxes are MADE IN AMERICA. Soap is a very personal product and though it costs more, your safety is important to us. Our boxes will not expose you to any risk of contamination. At Carved Solutions we make every effort to support MINIMAL PACKAGING, RECYCLING, and creating simple packaging that is elegant yet leaves little footprint on our environment. If you have any questions about this product by Carved Solutions, contact us by completing and submitting the form below. If you are looking for a specif part number, please include it with your message.